numerically using the R function 'ode'. This is a Thiele differential equation for a life insurance reserve with premium rate $\pi$, mortality intensity $\mu$ (for an $x+t$ year old), death benefit $b_d$ and interest rate process $r$. I want to do this in a so called unit-linked setting, where the returns on the policy are generated by investments in stocks, hence I have assumed a Black Scholes model for simplicity. 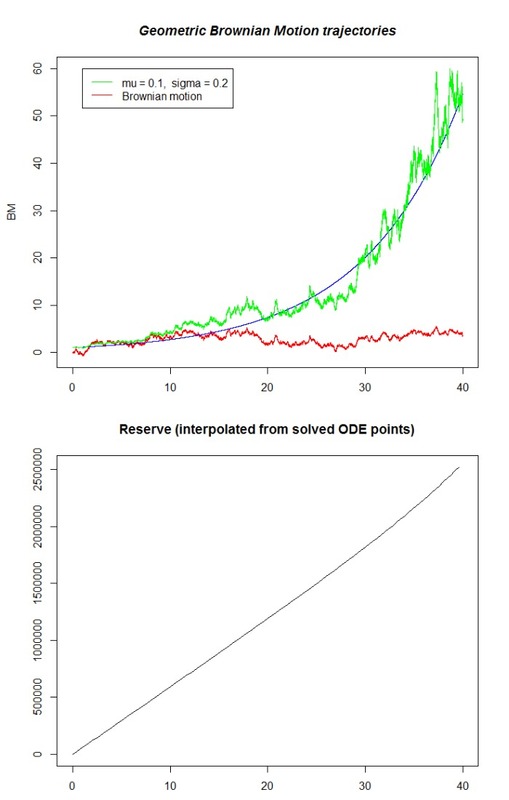 My problem is, at I would expect the reserve process to vary a lot more, much like the simulated Geometric Brownian Motion. In essence, it is too smooth, i think. 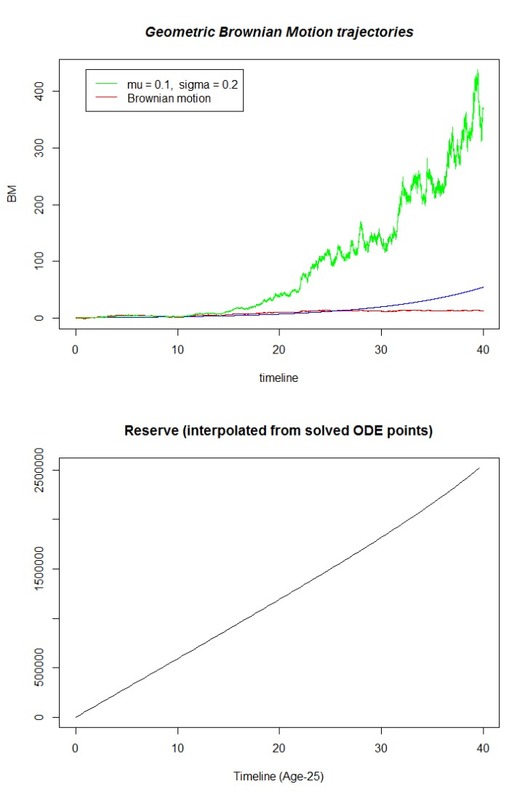 Also if I generate GBM trajectories which end in, say, the value 500 and 10 respectively, the difference in the final value of the reserve varies very little. Does anyone know why this is, am I doing something wrong? The R-code is attached. The problem is not that the approxfun function is not good enough, because I used it on the GBM to plot the green trajectory. I use 60000 as the premium rate (around 1000 dollars per month paid to pension) and a death benefit of 1.000.000 (realistic numbers in Danish Kroner). Is it because the returns $r\cdot V$ are too small to be noticed compared to the yearly premium rate? I would just suspect the reserve plot to follow the movements of the GBM roughly? I found a solution, but I am not exactly sure why what I did was wrong. Thanks to Quantuple for leading me in the right direction. Not the answer you're looking for? Browse other questions tagged black-scholes programming finance simulations actuarial-science or ask your own question.